The interior is spacious and well planned, with thoughtfully provided modern comforts & facilities. 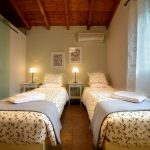 Both the double bedroom & twin have en-suite bathrooms. Just step out from the villa & you are at the poolside with magnificent views stretching across the sparkling sea to the mountains beyond. The town Gaios is reached by just a 25 min. walk into the centre square. 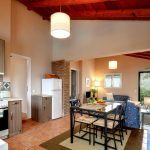 Open plan sitting & dining area with well equipped kitchen. This distinctively designed villa that is perfect for an unforgettable island escape. 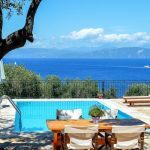 A haven on Paxos island which will offer its guests a unique experience. 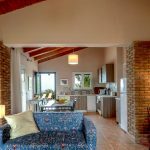 Villa Koukouli is fully equipped with modern amenities and caters all your holiday needs. 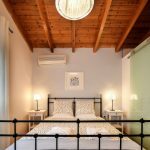 The interior has a tastefully decorated living and dining area, a fully equipped modern kitchen as well as 2 bedrooms and 2 bathrooms with shower. The layout is organically designed to optimize the beautiful sea views and the seamless flow between indoor and outdoor spaces. The patio has a colorful variety of potted shrubs and plants and is surrounded by olive trees offering shade from the midday sun. Admire the Ionian laying on a comfy sun bed that overlooks your private pool. Enjoy a sunset cocktail at the sitting are right next to your pool or prepare a delicious BBQ meal with fresh fish. 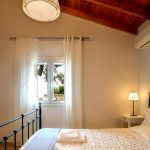 It’s an experience you’ll never forget, living the Greek island lifestyle in the comfort of your own villa. 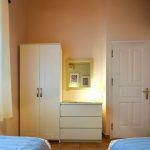 It is ideal for small families with children & couples! The white sand of Kloni beach is just a short walk and its crystal waters invite you to feel the summer vibe. Gaios, which has held on to its original Venetian layout and architecture, boasts a few prized possessions, like the old British governor’s mansion and the church of Agii Apostoli with an impressive cistern above it. Wander into the old shops and cafes, some unchanged since they first opened at the turn of the last century. 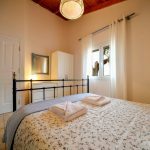 This cozy traditionally designed vacation home is the perfect place to begin your holiday in Paxos. 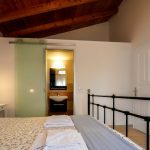 Villa Galetta offers a real trip back in time, with the simultaneous provision of all modern comforts. 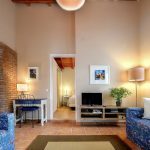 The interior of the villa has 2 bedrooms and 2 bathrooms, a stylishly decorated living and dining area and a fully equipped kitchen. Live an idyllic Greek island escape relaxing on your sofa or the outside dining are, while relishing the endless blue of sea and sky. Step out to the pool area and enjoy the peaceful environment, dazzling sea views, your sparkling private pool and comfy sun beds. 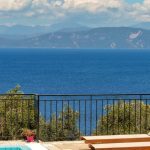 Large terrace constructed of local Paxiot stone with a covered dining area for al fresco dining and a swimming pool with breath taking view over the blue crystal waters of Ionian Sea. The pool area is separated from the terrace by a trellis fence, making it ideal for families with young children.